Samsung in April launched a revised version of its Gear VR headset. While the wearable now includes a wireless motion controller, it’s still limited by the fact that it requires a high-end Samsung smartphone to power the experience. We heard rumblings last month that Samsung was working on a true standalone VR headset and now thanks to a virtual reality eye-tracking company by the name of Visual Camp, we’ve got full details on the secretive headset. Visual Camp on Monday published a press release boasting that Samsung’s Exynos VR III headset utilizes its VR eye-tracking technology. 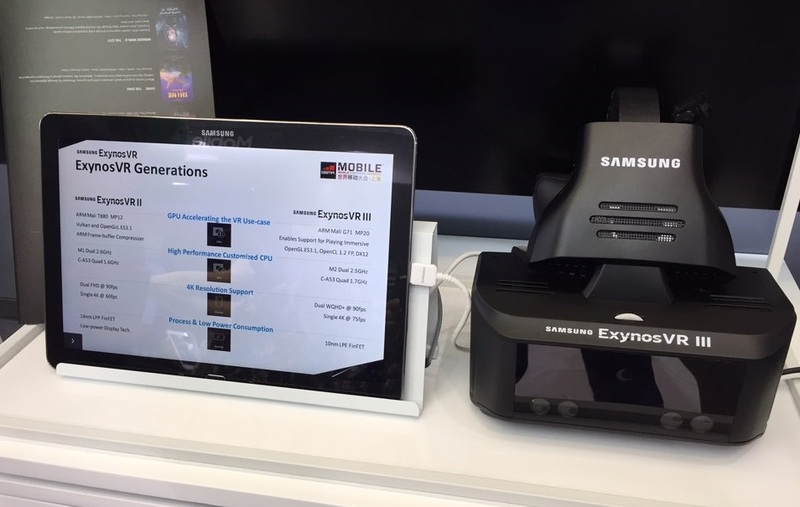 The company said Samsung revealed the Exynos 3 and VR reference platform at the recent Mobile World Congress in Shanghai but news of the device was never shared publicly (meaning Visual Camp probably wasn’t supposed to speak publicly about it yet). A photo accompanying the release reveals the standalone headset is powered by an ARM Mali G71 graphics chip along with two M2 CPU cores clocked at 2.5GHz and four Cortex-A53 cores running at 1.7GHz. The setup can reportedly drive dual WQHD+ displays @ 90 frames per second (or a single 4K display @ 75 fps). Visual Camp says the headset also supports hand tracking, voice recognition and facial expression recognition. No word yet on when Samsung plans to introduce an official product as it’s clear from the image above that what’s been shown behind closed doors is still in the prototype phase.